For some people space is extremely valuable. This is especially true for people that live in big cities where space has become smaller and smaller due to the increasing population of urban dwellers. Those who do not have much space in their home or office will appreciate the picture table. 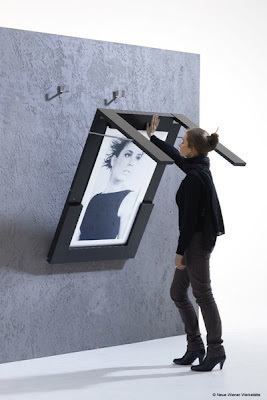 The picture table was designed by Verena Lang. Verena Lang is an Austrian designer. Verena decided to create an innovative piece of furniture that offers two things – art and dining space. That picture table resembles a painting on the wall and looks as if an individual has displayed a really beautiful photograph in a unique picture frame. However, there are bars across the frame. Once the bars are opened a person is instantly provided with a sturdy and nice table that can be used for dining or work. Each table can be customized with the user’s photograph of choice, preferred color of the wood, and fabric. The table offers a very modern and space efficient twist in design for those who have to forgo a traditional table. The picture table is like a normal table and is somewhat reminiscent of the Murphy bed. For now, the picture table is a concept. Hopefully, it is a concept that will soon become available so that more people have a practical and beautiful piece of furniture that will work well in tight spaces.